The Villa is part of a historic estate of 50 acres just minutes from Bolgheri, Castagneto Carducci and the beaches of the Tyrrhenian coast. The villa from the 700 is immersed in the Mediterranean nature, surrounded by olive groves and vineyards of quality. Internally the villa is furnished with period furniture, refined and elegant style, giving the rooms comfortable and elegant atmosphere. On the ground floor are the dining room and large living room with sofas. The main entrance of the villa you enter the large panoramic terrace furnished with tables and chairs. Upstairs are 10 elegant rooms, each decorated differently. Adjacent to a Villa there are two annex that houses 14 rooms many with little private outdoor space. Inside the elegant Villa park are a swimming pool, tennis courts and a small private chapel whose walls are covered with finely edera.Nel from the Villa restaurant you can taste traditional Tuscan dishes made from organic products of the farm, homemade pasta and selvaggina. On request it’s possible to visit the nearby wineries of important Italian productions such as Sassicaia, Ornellaia, Paleo and Grattamacco. Stay in the estate is particularly recommended for elegant atmosphere, silence and the great charm that contraddistigue this enchanted place. Rates are per room (2 pax), daily breakfast buffet included. 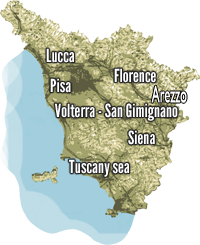 On Request: Cooking classes and wine tasting at the most ‘important wineries in the area producing Sassicaia, Ornellaia, Paleo and Grattamacco.